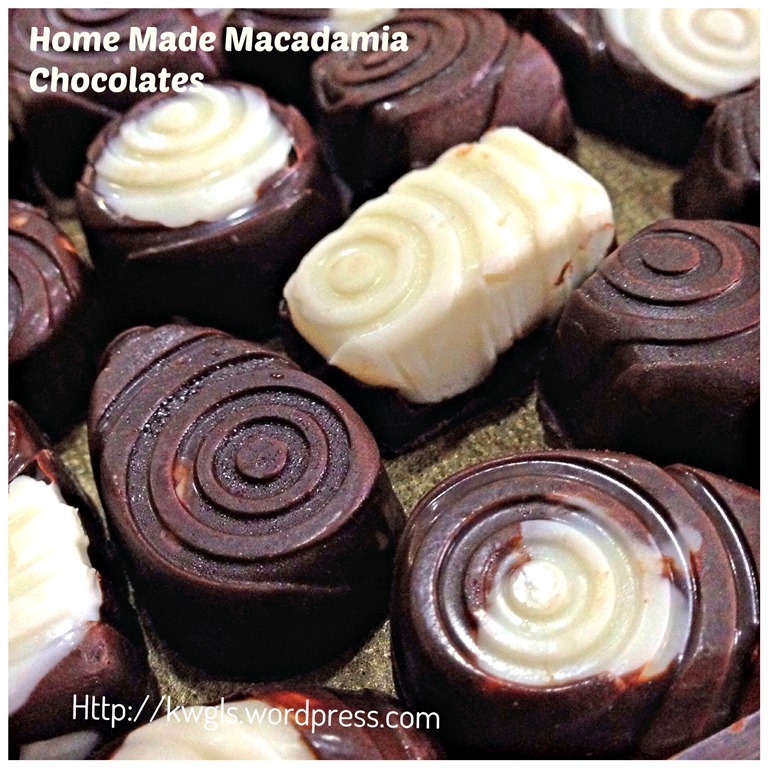 “Homemade” Macadamia Chocolates Are Definitely A Presentable Gift.. I have prepared these chocolates for my kids to bring back to hometown and gave to relatives as hand gifts. 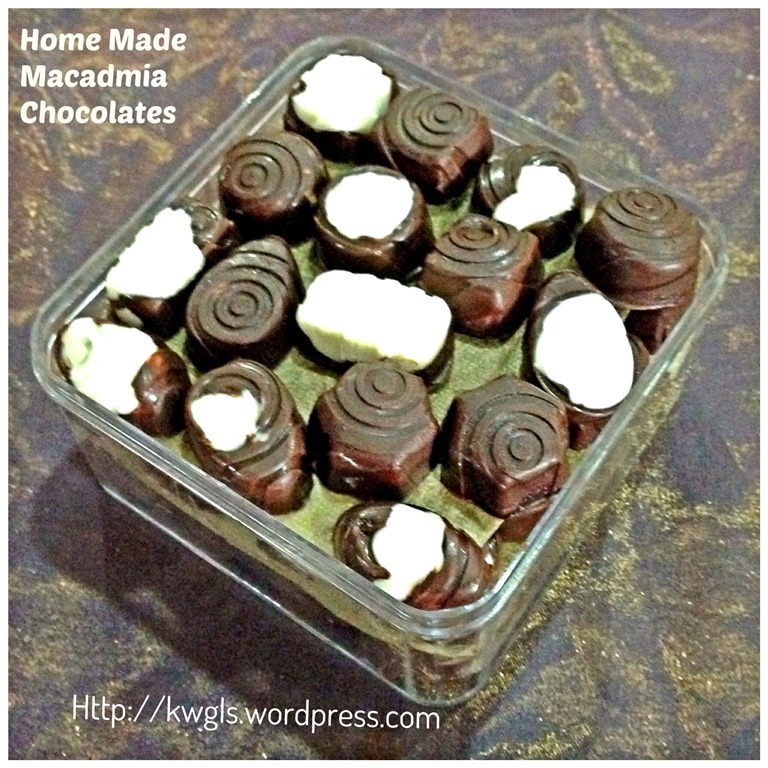 Not long after they arrived, my relative called and “ordered” another few more boxes of these macadamia chocolates. 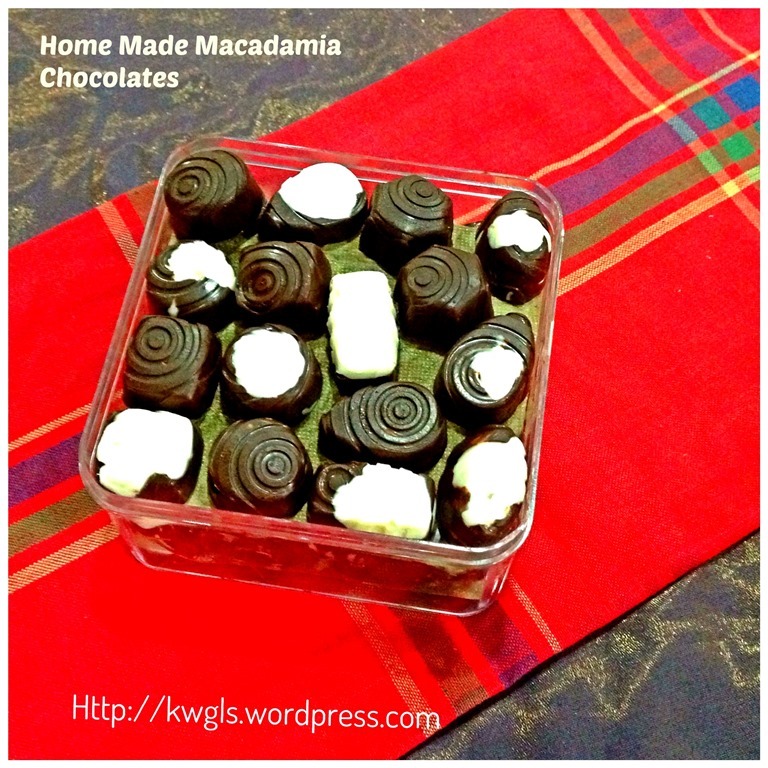 She is schedule to have a business visit to Singapore on early December and to save her trouble of finding the suitable presents, she had decided to order these homemade macadamia chocolates as hand gifts for her colleagues. What is so great about these chocolates, I have to be frank that there is nothing that great. It is just a bit of hard work of remoulding the chocolates and making it unique and presentable as gifts. Preparation is definitely not difficult. It is the thoughts that counts. 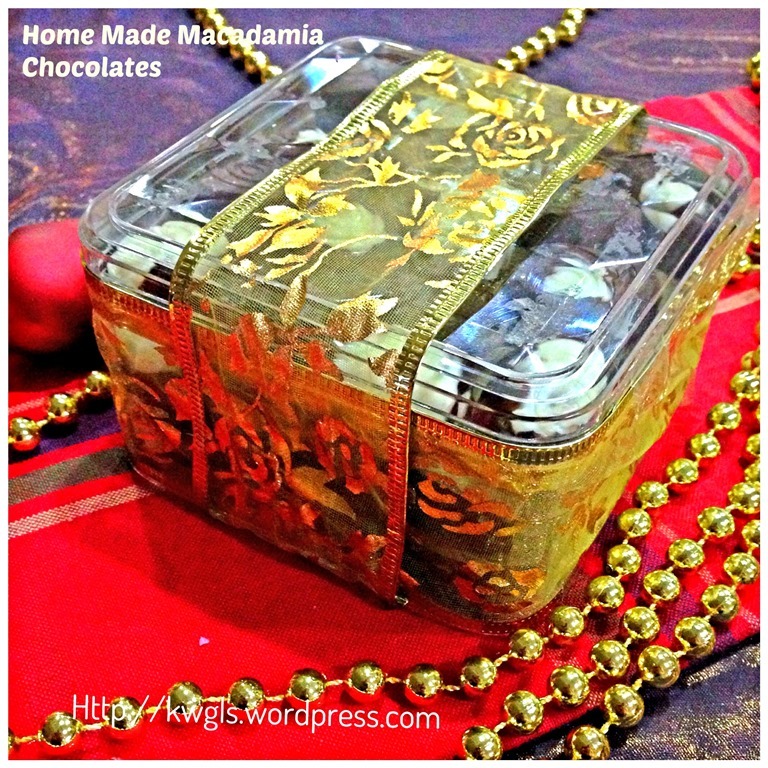 What I am sharing now is not really a recipe but some way of re-moulding the chocolate which in my humble opinion, make it presentable as hand gifts particularly during Christmas. Don’t forget, variations are many and packaging is of utmost importance.. Frankly speaking, I am not really satisfied with the packaging that I have as I am short of time to source the type of packaging that I want. This is not really a recipe, variations are many and very much depends on individual taste buds. Therefore no detail quantity will be listed here. Some nuts of your choice (I use chopped macadamia nuts because my chocolate mould is too small to accommodate whole nuts). 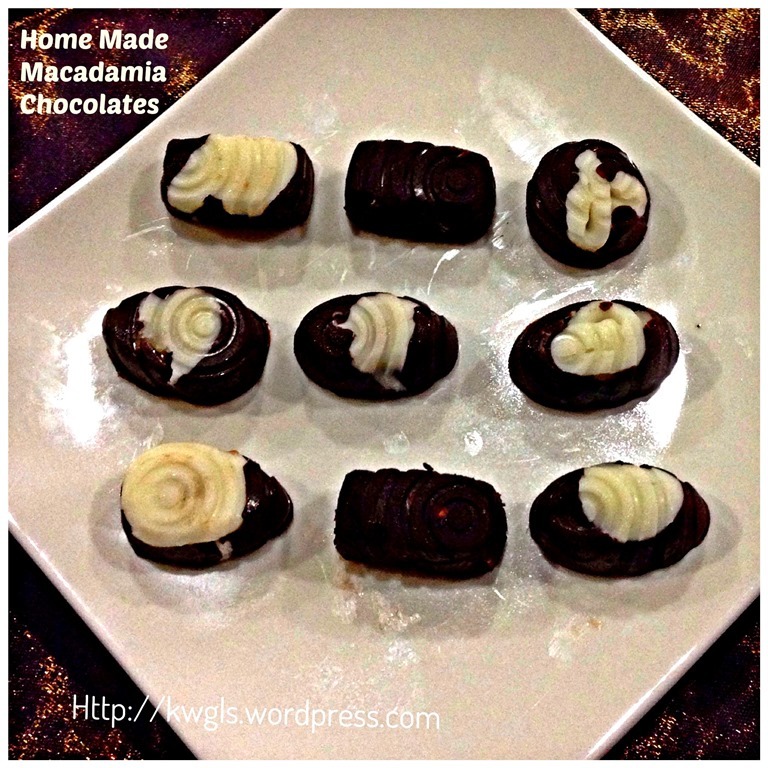 Heat the chocolates in the microwave oven for about 1-1.5 minutes. The timing very much depends on the temperature of the chocolate (from fridge vs. at room temperature) and power of your microwave oven. Stir slightly to ensure all are melted and become smooth. 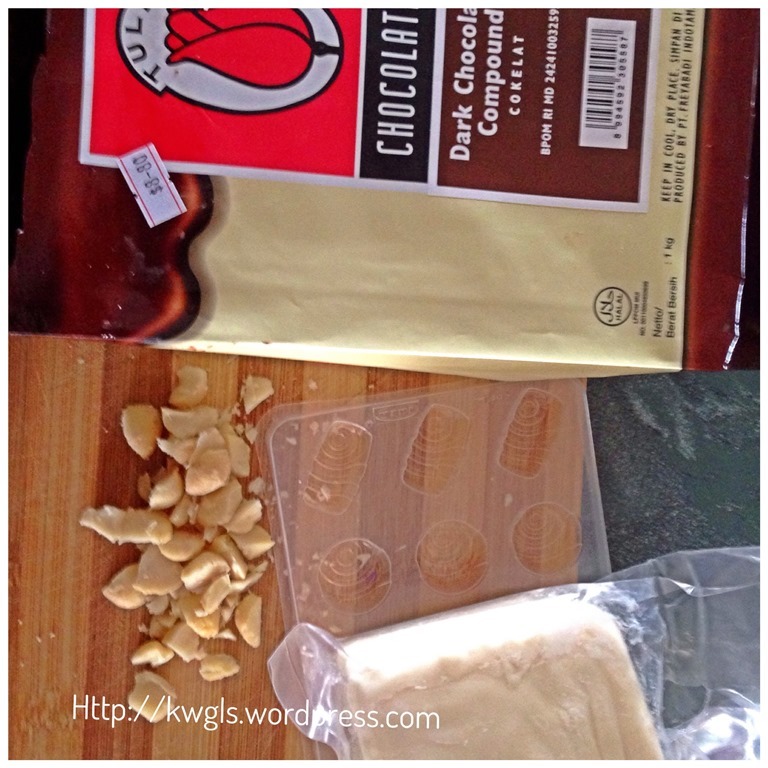 Put the chocolates into two piping bags (one for dark chocolate and one for white chocolate). 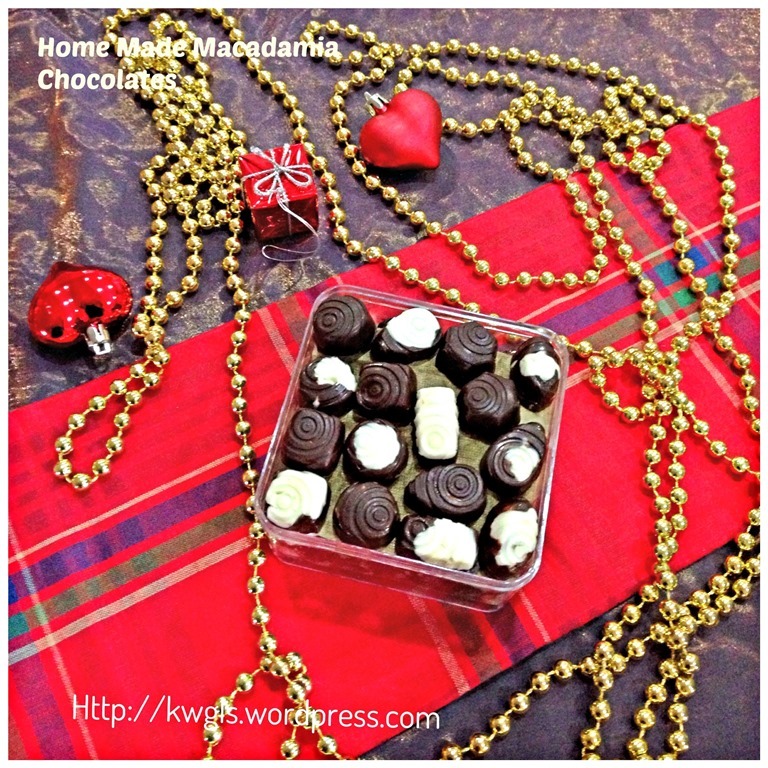 Cut a hole at the tip of the piping bag and pipe the chocolates to in your desired pattern. It can be half white and half dark chocolate, or top is white chocolate and the bottom is dark chocolate. In between the chocolates, add some nuts of your choice. 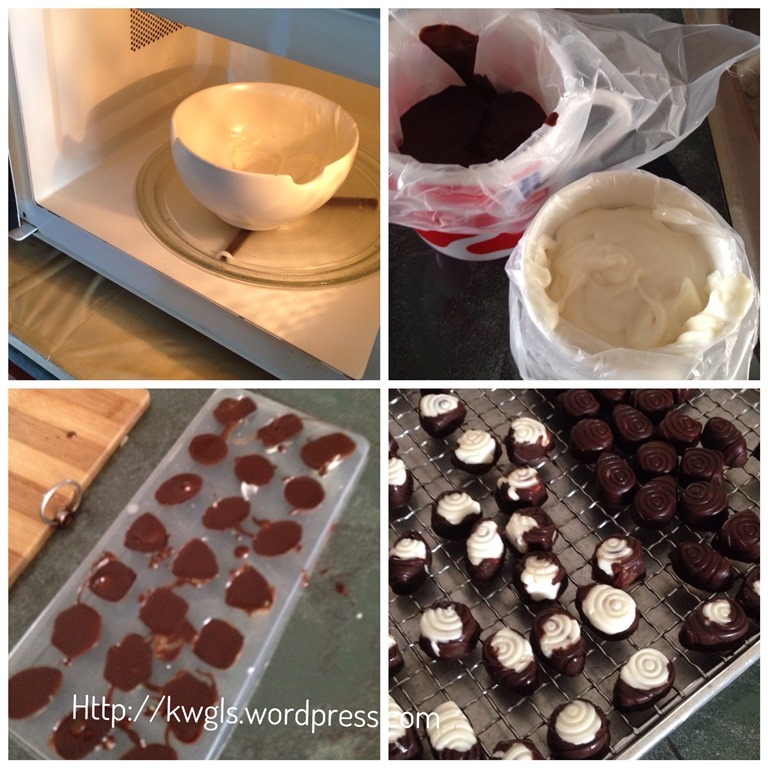 Chill the chocolate in the refrigerator for about 5 minutes and de mould the chocolate. How to de-mould will very much depends on the types of mould you have. As mine is very thin plastic mould, the de-moulding is extremely easy by bending the plastic mould. Another gift ideas for your Christmas. Trust me, it is not the chocolate that counts. It is the thought and hard works that the recipient will appreciate. Don’t forget a presentable packaging. 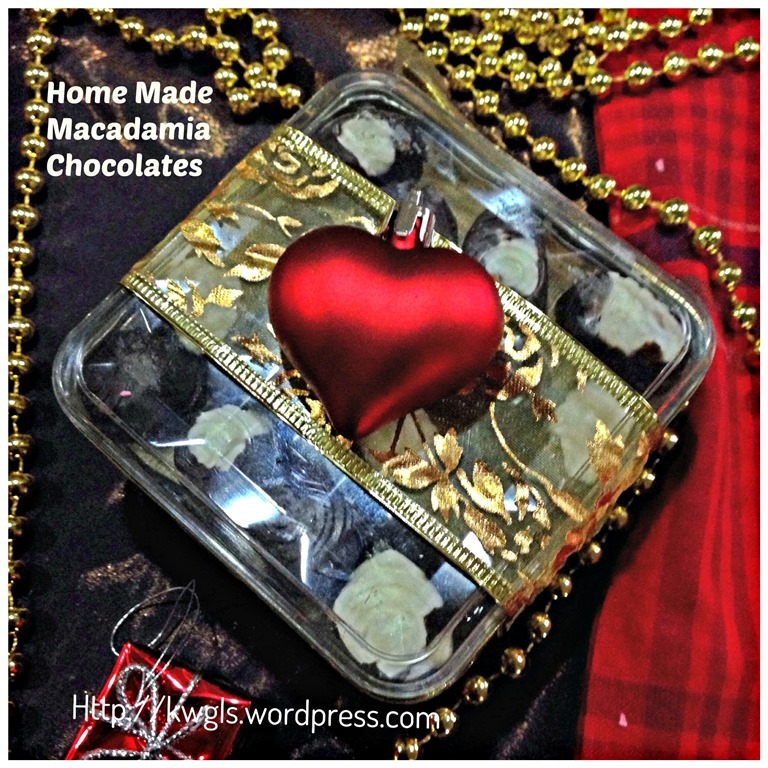 That will definitely your simple homemade chocolate into a classy and elegant gift. For Four Seasons Blog Hop #27 (Nov 21) where I am the Co-host, please join us for the party where you can get a lot of the family related posts. Please click the above logo to enter your post. 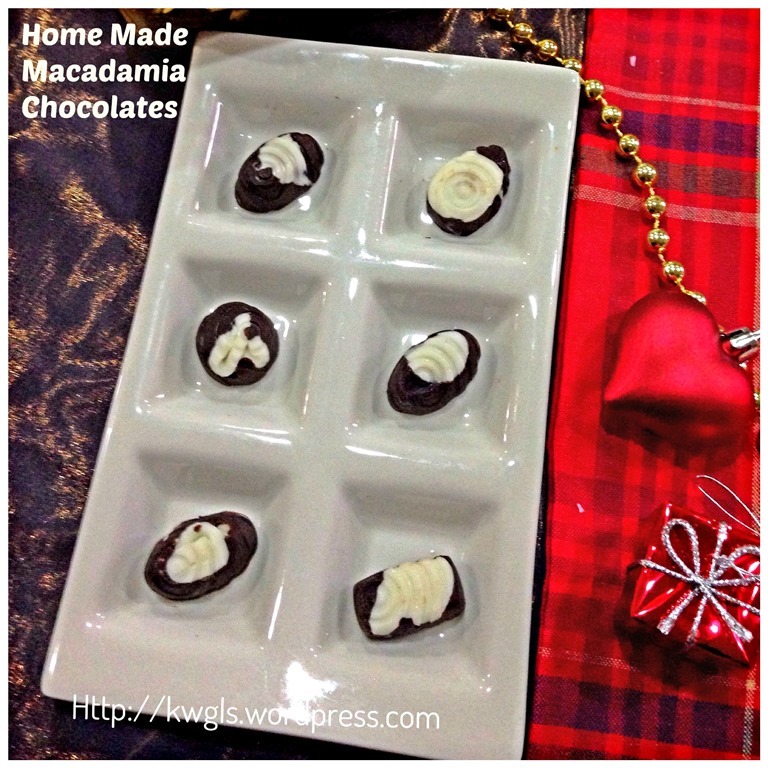 This entry was posted in Chinese and Asian Cakes and Snacks, Christmas 2013, Food Preparation Series, Snacks and tagged 8, GUAI SHU SHU, Guaishushu, Home made chocolates, Home made Macadamia chocolates, postaday. Bookmark the permalink. These are adorable and look like perfect handmade presents 🙂 Visiting from the Recipe of the Week linky! Very pretty indeed and definitely agree they’d make great gifts.